I attended my first Craft Fair as a seller last Thursday and it was a great success! Yes I made a modest profit after expenses but the main enjoyment was meeting the public and other sellers. It was a Craft and Gift Fair and held in an old wooden Scout Hut which was rather charming. It had a good mix of sellers ranging from wildlife photography, vintage jewellery to knitting plus a very nice cake stall (at last someone that does proper Tiffin)! I was given a corner with two tables which threw me a little as I had planned my layout on only having one; thank goodness I had taken along plenty of tablecloths with me. Luckily I had plenty of time to rethink my display so it all worked out in the end. I was also given a chair (which was comfy thank goodness) and had a nice little corner at the end of my table that allowed me to sit and do my crochet during the quiet times. The Fair was in held in Bakewell a beautiful historic town in Derbyshire that is on the tourist trail. So a lot of the people that attended were holidaymakers (with children) who had not planned to come along and nor were they looking for anything specific. Luckily I had lower price items such as my Hedgehog Pin Cushions which proved popular to browsers, adult and children alike. This highlighted that if I am going to attend further fairs in the future I need to have a wider range of lower priced items, some being attractive to children. I also got a lot of positive feedback, as people remembered their grandmother’s embroidered tablecloths and thought it lovely that someone was doing something with them rather than leaving them in a cupboard. This gave me the opportunity to explain how I had got started and although they often did not buy anything they did take away leaflets and business cards and will hopefully pass these on to friends and family. It was hard work and the preparation for such an event must not be underestimated and although I thought I was organised everything took twice as long as expected. For example I normally only print out labels etc as and when I make an online sale but suddenly I had to do this for 30 or so items plus I needed additional material such as price tickets and carrier bags. Also you have to have a thick skin! Some people stood talking about my stall as if I was not there and a couple of times when someone was admiring my stall their friend said they thought my items were too expensive or they had seen something better! 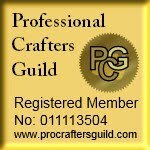 Still I would highly recommend it but you need to be prepared so I have added a check list to My Pages which will hopefully be of help to any Craft Fair novices like me! Very colorful and attractive display. YESSSSS, it's hard work, but sales are usually good at one of those events and it's good exposure. If you don't have business cards, get them. They are wonderful cheap advertising. There's little you can do about people with no taste or manners. Someone once said to me . . . there's 2 breeds of cat and you may interpret that however you choose, but as I mature, I find that so true and particularly in todays society. There's the alley cat and then there's the pedigreed type. There's another old saying . . . you Hope you had success with your first show and continue to have.